This project will contribute to the diversification of the farming industry in Eastern NC. As more and more farmers transition out of tobacco they are looking to produce other high value crops. NC is already the largest producer of sweet potatoes in the US and growers can make a reasonable profit from this vegetable crop. Many growers are already familiar with cultivating the crop as it is often produced in rotation with tobacco. Like tobacco, sweet potatoes are part of the fabric of life in many rural eastern NC communities so it is not too difficult to get growers to try new specialty-types. Large to medium-sized established growers can tap into well-established marketing outlets to market these new specialty-type varieties, while smaller and new growers interested in producing specialty-type sweet potatoes, can work to establish community-based niche markets. Several growers are already producing ‘Japanese’ and ‘Picadito’ specialty-varieties with acreage estimated to be over 300 acres. Indeed, one grower is currently producing ‘Japanese’ for use as chipping stock in addition to the fresh market. We believe that the potential for these markets has not been reached and that given suitable cultivars, NC could also be a leader in the production of specialty-type sweet potatoes. The Asian and Hispanic segments of the US population are the fastest growing sectors of the US population. Per capita, they consume larger quantities of sweet potato compared to more traditional consumers. However, Asian and Hispanic consumers prefer different types of sweet potatoes than what are typically grown in the US. These specialty-type sweet potatoes are often called “boniato- or Japanese-types.”. Sweet potatoes suitable for Asian and Hispanic markets typically have a high dry matter content and are white- to cream-fleshed, and they are more similar to a potato in texture and taste than the moist very sweet, orange-fleshed sweet potatoes typically grown in NC. Externally, they differ from the white-fleshed sweet potatoes grown here in that they generally have purple to red skin and have a milder flavor. To further complicate things, the Asian and Hispanic varieties look similar but differ in sweetness. Typically the Asian markets prefer sweet potatoes that are slightly sweet when cooked, while the Hispanic varieties are usually non-sweet. Currently there are no available boniato- type or Japanese-type varieties that are well adapted to NC’s climate. Part of the reason for this is that most of the growing regions for this type of sweet potato are semi-tropical or tropical. Also, most of these varieties are typically very long season, not resistant to soil rot, and they do not store well. This project will contribute to the diversification of the sweet potato industry in Eastern NC. NC is already the largest producer of sweet potatoes in the US. Large to medium-sized established growers can tap into well-established marketing outlets to market these new specialty-type varieties, while smaller and new growers interested in producing these can work to establish community-based niche markets. But, simply introducing new adapted specialty-type cultivars is not enough to ensure penetration into the Asian and Hispanic markets. It will take a coordinated effort in identifying, growing, storing and marketing these unique materials to insure that the right product, with high quality is delivered to these markets. The SCP is an ideal means in which to introduce specialty-type sweet potatoes to NC’s growers. During 2004, we evaluated 14 clones at the HCRS and 15 clones at the CRS in our specialty-type trials (Tables 1 and 2). Beauregard and Japanese were used as check varieties in each trial. Many of the clones, are lines that we have developed in our breeding program. Or they represent clones that we have collected from various sources and submitted to the NC State University Micro propagation Unit (MPU) for virus-indexing and field evaluation prior to evaluation in the field to prevent introduction of new viruses to the NC sweet potato production system. Both tests went very well this year. As typically experienced, yields at the CRS station were significantly higher due to the quality of the soils at that site. Each test was hand graded in the field for yield by No.1, canner, jumbo and cull classes and evaluated for horticultural characteristics including maturity, shape, shape variability, skin color, flesh color, eyes, lenticels, diseases present, length/diameter ratio and overall appearance. All the clones were also entered into our disease screenings for root knot nematodes, Fusarium wilt and pox. Tables 1 and 2 summarize the results of the specialty-crop trials conducted during 2004. We have bred or obtained a good collection of white to cream-fleshed sweet potatoes of varying dry matter content (18-30+%) and sweetness. Our collection of materials possesses white, purple, red and pink skin colors. 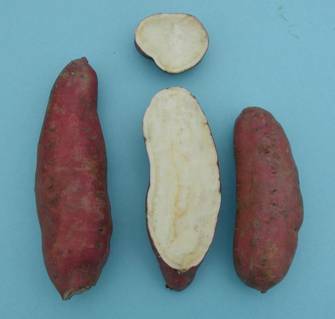 As part of our purple-fleshed breeding program (see our other GLF report) we have also either obtained or bred light to dark purple-fleshed sweet potatoes, which also have utility as a specialty-type especially for health conscious consumers. None of these new clones have been tested enough to replace the clone ‘Japanese’ which was identified by this project earlier as the best cultivar currently available for NC growers. However, we are encouraged by the performance of Grand Asia, NCBON02-442 and L258 (see Tables 1 and 2). The most popular Boniato-type sweet potato is ‘Japanese.’ Several producers are currently growing it, and we estimate that over 300 acres were planted during 2004. However, one of the weaknesses of ‘Japanese’ is its susceptibility to russet crack. It declines rapidly for yield and appearance making the use of clean stock very important. One of our goals for this year was to release a virus-indexed ‘Grand Asia,’ which is similar to ‘Japanese’ but have not seen russet crack expressed in this clone. We evaluated a virus-indexed ‘Grand Asia’ clone in both our trials this year. Its yield and dry matter content are very similar to that of the ‘Japanese,’ and its overall appearance is very similar, though ‘Japanese’ is generally more attractive and slightly shorter in length. ‘Grand Asia’ is now available in the MPU and several growers will be trying this clone during the 2005 season on-farm. ‘Picadito’, the main cultivar used for the Hispanic market, performed surprisingly well in both locations during 2004. It actually out-yielded ‘Beauregard’ in the CRS trial, but its appearance was 4.7 compared to 6.8 (1= poor ; 9 = excellent). We do not recommend this clone for NC growers because of its poor adaptability and appearance, though we realize that appearance per se is not the most important factor in the marketing of this variety. The best available sweet potato cultivar suitable for Asian markets in NC is ‘Japanese.’ ‘Grand Asia’ may also have utility but it will have to prove itself in large-scale trials, which will be initiated during 2005. ‘Picadito’ is the most widely grown cultivar for the Hispanic markets, but it has limited adaptation to NC. All three clones are susceptible to root knot nematodes and soil rot or pox disease. Picadito is also susceptible to Fusarium, while ‘Japanese’ is susceptible to russet crack. Because of the disease susceptibilities each variety should be grown in a sound rotation program and using clean planting stock. Virus-indexed micro propagated plants are available from the NC State Micro propagation unit. During 2005, we plan to continue further evaluations of specialty-type sweet potatoes as we have several new preliminary lines that show promise. Fig. 1. 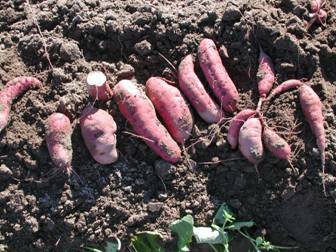 ‘Japanese’ sweet potatoes in a commercial field near Faison NC harvested October 16, 2003. Table 1a. Clinton Specialty Yield Trial. Total and marketable yield, percentage of total yield by size distribution and percent dry matters of sweet potato clones harvested 119 days after planting at the NC State/NCDA&CS HCRS, Clinton, Sampson Co., NC – 2004. Clones that had purple flesh color are suffixed with (PSP). Canners – Roots 1″ to 2″ diameter, 2″ to 7″ in length. Jumbos – Roots that exceed the diameter, length and weight requirements of the above two grades, but are of marketable quality. Percent US#1’s – Calculated by dividing the weight of US#1’s by the total marketable weight (Culls not included). Culls – Roots must be 1″ or larger in diameter and so misshapen or unattractive that they could not fit as marketable roots in any of the above three grades. Table 1b. Clinton Specialty Yield Trial. Storage root attributes1 of sweet potato clones harvested 119 days after planting at the NC State/NCDA&CS HCRS, Clinton, Sampson Co., NC – 2004. Kyukie 97 ML 35 2.5 pi sm 1.5 6 6 3,6 6 4 low yld, field survival? color (1=white, 2=yellow, 3=orange); eyes(0-9); lenticels(0-9); shape (see diagram); shape variability(0-9); overall appearance(0-9). Rating scale: 0= very poor to 9=excellent. Table 2a. Kinston Specialty Yield Trial. Total and marketable yield, percentage of total yield by size distribution and percent dry matters of sweet potato clones harvested 144 days after planting at the Cunningham Research Station, Kinston, Lenoir Co., NC – 2004. Clones that had purple flesh color are suffixed with (PSP). NC State/NCDA&CS HCRS, Clinton, Sampson Co., NC – 2004.
color(1=white, 2=yellow, 3=orange); eyes(0-9); lenticels(0-9); shape (see diagram); shape variability(0-9); overall appearance(0-9). Storage root data: MAT=maturity E=early, M=mid and L=Late; DM=percentage dry matter; L/D=length/diameter ratio; SKC=skin color clr=clear cu=copper, lt=light, or=orange, pi=pink, pu=purple, rd=red, rs=rose, tn=tan wh=white; SKT= skin texture, m fl= moderate flakiness of skin, lt fl= light flakiness to skin, ms=moderately smooth, sm=smooth; FL=flesh color (0-5 scale where 0=pure white, 1= cream, 2=yellow, 3= medium orange, 4=deep orange, 5= very deep orange; EYE=eyes(0-9); LEN= lenticels (0-9); SH=Shape (see diagram); SHV=shape variability(0-9); APP=overall appearance (0-9). All 0-9 scales go from low or poor to high or good. Comment codes: AT=tough attachment; B=bumpy shapes; BR=breeding only; BSR=bacterial soft rot; CR=cracking; CRK= crooked shapes; CS=circular spot; CV=skin color variation end to end; D=drop; EY=deep eyes; FB=fleabeetle damage; HC=horizontal constrictions; ID=unspecified insect damage; IRR=irregular; JL=jumbo’s for length; L=long; LE=lenticels; LG=longitudinal grooves; LR=Lateral rings; LT=latex; MSH=misshapen roots; NS=nice shapes; OV=ovate or pear shapes; PI=pimples (0-9); PN=pencil roots; PP=pulled plants; R=rodent; RC=russet crack; RG=restaurant grade; RH=root hais; RKN=root-knot nematodes; RSK=rough skin; RT=rot; SD=skin discoloration; SH=sheen; SG=string roots; SK=skinning; SO=souring; SPR=sprouts; SR=soft rot; SS=stays short; SSR=streptomyces soil rot; STR=Striations; T=tails; TP=tapered roots VN=veins; SC=scurf; SF=surface Fusarium; WB=whitefringed beetle; WG=white grub; WW=wireworm; YCR=yellow cortical ring; YLD=yield; 2oR=secondary roots.